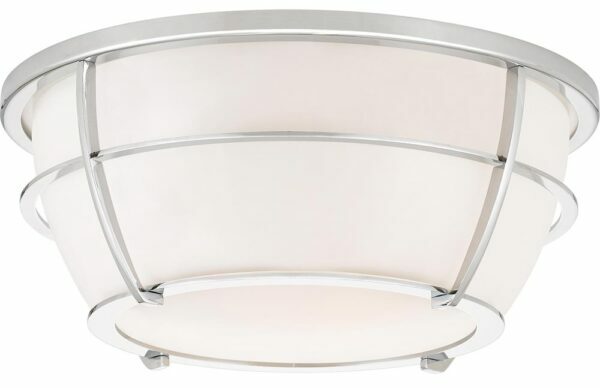 This Quoizel Chance 2 light flush mount bathroom ceiling light in polished chrome is rated IP44 and features Art Deco style and geometric design. Circular 33cm diameter mount, with bright chrome frame formed from curved vertical bars and rings around a central opal white glass shade. A stylish, bright bathroom ceiling light that boasts a hint of Art Deco and looks fantastic in period, traditional and contemporary bathrooms alike. Rated IP44 and suitable for zones 1 and 2. Specifically designed for use in bathrooms but can be used anywhere inside your home except wet rooms. This bathroom light is supplied by Elstead Lighting and designed in the USA by Quoizel, founded in 1930 in New York. Their designs embody a history of being artisans in glass and natural materials that illuminate your living space and enhance the beauty of your home, such as the Chance 2 light flush mount bathroom ceiling light in polished chrome and rated IP44 featured here.